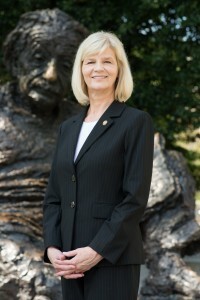 Deborah Cornelison, with a sculpture of Albert Einstein. Last month I attended the Global MindED Conference in Denver, Colorado and was able to meet many wonderful people working toward improving global education. Conference attendees included teachers, administrators, policy makers, and technology and industry professionals. There were also college students at the conference, such as Perla Bustillos, who was also featured in a STEM Girls Spotlight blog. This interview is with Deborah Cornelison, who was a speaker for one of the STEM sessions at the conference. Hillary: Why did you study biology and chemistry in college? What were your career aspirations as you chose that degree? Deborah: The small rural high school that I attended many years ago employed no academic counselor, and I entered a local two-year community college undecided about what career I would pursue. There I found the biology and chemistry courses interesting and challenging, so I completed several courses before deciding to major in Medical Technology after attending a presentation by professors from a regional four-year university who were recruiting students for the new major at that time. I transferred to the university and completed the coursework for Medical Technology. However, I married and did not enroll in the required one-year hospital internship. I worked in the oil and gas industry for a year and was a stay-at-home mom with my son until he reached school age before I returned to finish my degree and complete teaching certification requirements. It took me a while to find my place as a STEM educator, but it has been a meaningful career. Hillary: Have you had any strong mentors throughout your educational and professional work? How did they help you to succeed in STEM? Deborah: Beyond my supportive parents, many individuals influenced my success in STEM throughout my years as a student and professional educator. From 5th to 12th grades, I was involved in the 4-H program where I first engaged in project-based learning, public speaking and presentations, and leadership training and responsibilities, with mentors from the county extension office and community who helped me develop my abilities and learn valuable life skills. My high school teachers and college professors encouraged me in various ways, including being there when I wanted to talk about ideas, issues, or problems. Through professional activities in rural Oklahoma and across our nation, I have countless colleagues and STEM professionals who have informally mentored me in our collaborative work by sharing their expertise, experiences, and encouraging words. Hillary: You have won many awards in education. How have you taught science in a way that students really benefit from it? Deborah: For 26 years, I taught 9th grade physical science in a rural, high-need school in Oklahoma where I did my best to provide engaging and rigorous learning experiences for all of my students. Because I had previously taught biology and physical science as an adjunct instructor at the local university, I realized the need to help learners develop a fundamental understanding of physics and chemistry, the basis for understanding all areas of natural science. Learning in my classroom was hands-on, problem and project-based, with ongoing opportunities for students to make choices and direct their own learning. We constantly made connections among concepts, science disciplines, and the real world. I also mentored junior high and high school science research students and student teams who successfully planned, implemented, and presented their projects in regional, state, national, and international STEM competitions. Many authentic learning experiences evolved from student research to include and benefit all students and staff in our school. Most recently, I transformed the physical science curriculum to an interactive digital format as I implemented blended learning in the classroom to enhance personalization and collaboration. Most importantly, my students knew that I was always learning. I think that inspired them to learn things that they could teach me. Hillary: What has been your most exciting or unique experience related to STEM? Deborah: Among so many exciting STEM experiences in my career, my recently completed 2014-15 Albert Einstein Distinguished Educator Fellowship was definitely a highlight. My host agency was the National Science Foundation (NSF) where I worked in the Directorate for Education and Human Resources in the Division of Undergraduate Education. My primary assignment was the Robert Noyce Teacher Scholarship Program, and I also was a team member of the Presidential Award for Excellence in Mathematics and Science Teaching program of the Human Resource Development Division. Interacting with and learning from STEM professionals at NSF and in other government, corporate, and nonprofit agencies in the Washington, D.C., area was an exciting and invaluable opportunity that broadened my perspective of STEM and enhanced my ability to contribute to STEM education and workforce initiatives in the future. Hillary: If you were to change careers completely, what do you think you would be doing? Would you still be in a STEM field? Deborah: It‚Äôs hard for me to imagine myself in a career that didn‚Äôt involve education and/or STEM. If I made a change, it might be in the medical field where I would still be working with people and using STEM knowledge and practices. Hillary: Do you find yourself gravitating toward STEM-related hobbies outside of work? If so, what do you enjoy doing in your free time? Deborah: When I have free time in my schedule, I‚Äôm usually reading books, articles, and research related to education, new technologies and discoveries in science. Hillary: What is one piece of advice you would give to a young girl who is interested in STEM? Deborah: I would tell her to be confident in her abilities, to be willing to work as long as it takes to be successful, and to find others who share her passion for STEM. Thank you so much for sharing your thoughts with us, Deborah!